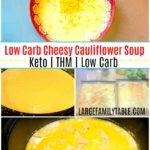 Make ahead this low carb cheesy cauliflower soup that’s wonderful in the slow cooker! Use an inexpensive immersion blender to finish the job right before serving. Top with sour cream, bacon bits, and green onion! Divide ingredients into two labeled freezer bags, freeze up to 3 months. When you desire to serve this recipe just thaw the bag in the refrigerator the night before. On cooking day dump contents of the bag in the Instant Pot or Slow cooker. For Instant Pot cook soup on manual high for 20 minutes. For the Slow Cooker on high up to 3 hours, low 4-5 hours. Once the cooking time is complete use an immersion blender to gently blend the soup to desired consistency.